The most common cause of blindness among Americans over age 50 is age-related macular degeneration (ARMD). This is a disease associated with aging that gradually destroys sharp, central vision. ARMD affects the macula, the part of the eye that allows you to see the fine details of what you focus on. Dry ARMD causes blurry central vision and is often diagnosed by the presence of yellow deposits under the retina called drusen. The amount and size of the drusen indicate which stage of ARMD a patient has: early, intermediate, or advanced dry ARMD. Wet ARMD occurs when abnormal blood vessels start to grow under the macula in the retina. 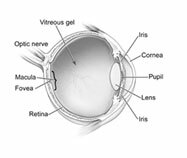 They often tend to leak blood and fluid, which cause the macula to raise from its normal place at the back of the eye. Both dry and wet ARMD cause no pain. For dry ARMD the most common early sign is blurred central vision, usually noticed when reading or looking at faces. As the disease progresses, many people may see a blind spot in the middle of their field of vision. For Wet ARMD, early signs include straight lines that appear wavy or there is a dark spot in the center of your vision that gradually gets larger. What are Causes or Risks Factors? Researchers are not sure what causes ARMD. This disease presents mostly in people age 60 and over, which is why it is commonly referred to as age-related macular degeneration. What are the Treatments for Macular Degeneration? The goal of treatment is to preserve eyesight and prevent future vision loss. As with most diseases, early detection can help to slow the progression of the disease. In the early stages of macular degeneration, treatments can be used to prevent the disease from getting worse. Although there is no treatment to reverse dry ARMD, taking a high dose formulation of antioxidants and zinc may reduce the progression of the disease. Wet macular degeneration is commonly treated with injections, photodynamic therapy or surgery. Some new drugs and surgical procedures are currently being tested. The only way to know if you have early macular degeneration-and to start treatment to prevent it from getting worse-is to have routine eye examinations even if your eyes seem fine.